Business Regions Resources Chambers Public Discussion --please join in !! 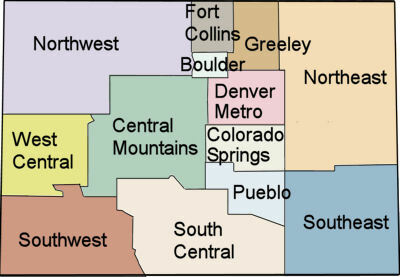 Please click the map below or the menu to the left to view Colorado small business resources by Colorado business region. Business resources available include links and information about Colorado chambers of commerce, small business development centers (SBDC), city and county information, economic development groups and interesting comments and pictures of the business region. ... "Therefore, be it resolved that Colorado can provide quality, affordable health care for all Colorado residents, with a health care system that is not tied to employment, marital, financial, or health status and yet is fiscally responsible."